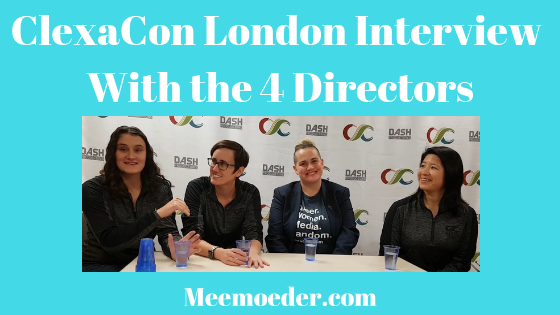 At the very first European edition of ClexaCon, the four directors sat down to talk about their amazing event for LGBTQ+ women. I wanted to know what it meant to them personally to be at the first edition abroad of an event that they have created from scratch. Also, what are some of the projects that have emerged as a result of ClexaCon? Below, you can read what Ashley, Danielle, Holly, and Heidi believe is the importance of ClexaCon. The interview was too long to write down fully. If you want to see the full interview where the directors talk about the importance of ClexaCon and how their event contributes to better queer representation, I recommend watching the video that is included below this image. Me: What does it mean to you personally to be here at the first European edition of an event that you created? Danielle: We are really excited to be here. We have been wanting to do an event in Europe for a long time, for two years, since we started doing ClexaCon. So, it is really exciting to be here and have it be happening and have so many people come from all over the world again to join us in London. Why do you think Clexa and the legacy of Clexa continues to be such an important legacy, even two years on now? Danielle: I mean, she is an incredible character. The role of Lexa and the relationship of Clexa were incredibly important to a lot of us. It is one of the best roles I have ever seen on TV for queer women. So, I think for a lot of us that resonated. The impact of how she died on the show, how she was killed off, really sparked a lot of anger. It got people really mobilized in a way that we had not seen before. I think that is still carrying on. People are still mobilized because of that. I think that character is really going to live on through us all being mobilized to make sure we have better characters on TV and in film. How did you all come together to create ClexaCon? Ashley: It was originally Holly’s idea and then we individually jumped in. ‘This is something that we want to participate in and let’s make it bigger and better. Let’s throw in a film festival. Let’s make it three days and let’s whatever else we do in Vegas. We do way too much. It just kind of exploded and Heidi has been there with us ever since. Me: Was ClexaCon London a lot harder to organize than ClexaCon Vegas? Danielle: Yes. I guess it is always harder to work in a country you are not familiar with. Even though we technically all speak the same language, it does not always feel like it. And things are different over here. Me: What were some of the obstacles you ran into? Ashley: Sometimes, it is just the little things. We call mixed drinks, like vodka and soda, mixed drinks. Here, it is called something else and we had to explain what mixed drinks are four times today alone. So, I think it is the little things like that that add up. Me: Also, the time zone? Ashley: Oh, that was really hard because we are not early morning people. We have become early morning people. Our meetings would have to be at 6 am our time. That was tough. Danielle: And I think, on a larger scale, the idea of a ComicCon or an event like this is very normal now in the US. Agents and talents are very used to going to these events. For the agents and talents in the UK, it is still a newer idea. Often, the guests who are coming are US guests who are used to it and not so much the UK-based people. That was a learning experience for us, to navigate that. Holly: Also, stores closing early if we had to go get something. Businesses are just run differently. Danielle: Your Amazon does not work as well as ours. Back to the importance of ClexaCon. Looking at the schedule for the panels and the scale of it, even for two days, what is the idea behind that? Ashley: The workshops and the panels are the guts of this event. We want people to go to them. And we want people to learn how to create content and get involved in content creation so that we can have more representation, better representation. We attack all those panels, and it really is an attack, from all different angles. People submit their ideas, which we love. Give a good description of what you want and we will do our best to make it happen. We try to do a lot of diversity panels and ‘how to’ panels so that we can really carry on in a positive way. It is a big effort. Danielle: It is very intentional that we have such a broad range of topics. We do tend to start out by having submissions. If people are not submitting certain topics that we think are really important, we will go out of our way to find people to talk about this topic. What can TV do to promote queer representation through events like this? Danielle: Separately from events like ours, they are getting better, especially in the US. I do not know so much across Europe. They are getting better in the US. There are more queer characters being added and they are given better roles. They are not the stereotypical sidekick roles and they are not getting killed off as often. So, I think we are seeing baby steps in that direction, so we need to have that happen more. We need to have LGBTQ women involved in the process. After all, it is very hard to change the industry if you do not have different voices making decisions. That is why the ‘how to’ panels and the workshops are so important to us. We want to be supporting queer women who are making content or who want to make content and encouraging more people to get involved. Me: Another thing about the importance of ClexaCon. You also want to create network opportunities from guests. Have you received feedback from guests who attend the previous two Vegas editions how it has helped their careers? Ashley: We definitely have. On a smaller level, we see ideas that have formed at ClexaCon come all the way through. They are now a web series. That is awesome. They met their lead actor at our event. They met their writer or their make-up artist at our event. There are many ways we can get involved in content creation. I think ClexaCon is definitely a place where you can come and meet people to start something and to make something beautiful because it has happened. Danielle: There are two web series that are coming out in the next three or four months or maybe premiering at the next ClexaCon that totally came from people meeting at ClexaCon. That is super exciting for us to see that it is really helping people. On a larger scale, we have heard through the grapevine that actresses have met producers and writers at our event and have had conversations after the fact because of the meeting at ClexaCon. From the people starting content creation to the stars of the show, we know that it is helping them. As you can tell from the video, the directors of ClexaCon believe in the importance of ClexaCon in their core. They may have other jobs but they devote the rest of their time to ClexaCon as they believe in the cause. I agree with Holly that bad representation is worse than no representation at all. About sixteen years ago, when I had recently come out, I watched a lesbian web series from the Netherlands. It was so bad in terms of acting, chemistry, writing, and camera work that it actually had me questioning my sexuality. I also agree with Holly that the age category of thirties-forties (and probably also older than this) is underrepresented. We are often in the background. If we are in the picture, it is usually about our marriages not going well. So, let’s hope some brilliant ideas are being developed at the next ClexaCon edition! Do you already know everything about the importance of ClexaCon? Do you just want to go to the interviews I had with actors at ClexaCon London? Here is my interview with Jamie Clayton, the team behind I Can’t Think Straight, Nicole Pacent, and Mandahla Rose.